No Tricks...Only Treats Halloween Gift Basket is rated 5.0 out of 5 by 21. Rated 5 out of 5 by AnneB from Fun! And easy to order! Purchased for an event that my husband and I were not able to attend- it was the talk of the evening! The Hosts loved it!!! Ordered a few days prior- shipped and received prior to event !!! Will use these guys again!!! Fun and different items too!!! Rated 5 out of 5 by Mama L from Great treats! I sent this to my son who lives out of state and when he received it he was thrilled! All of the candy was exactly as described and was pictured! Very satified. Rated 5 out of 5 by Moe1 from Cute title. Quality is good. I liked that the candy was all Hershey. Rated 5 out of 5 by Amisett from Great basket of candy! The kids I ordered it for loved it including the adults. It was like Christmas in October and it arrived as scheduled. Rated 5 out of 5 by Mara from Halloween Treat I bought this for a Halloween gift and it was wonderful. It arrived on time and the child loved it. 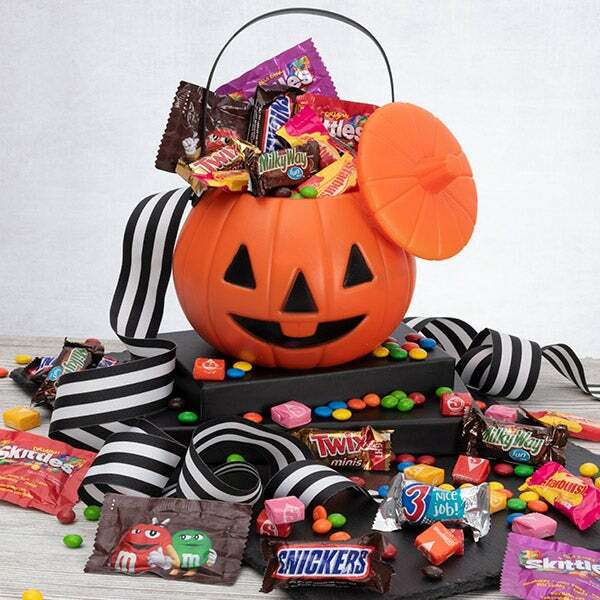 A perfect mix of chocolate and candy sweets, this Halloween gift basket is sure to give everyone a whole lot of their favorite Halloween candy. Trick or Treating can be a mixed bag, but our “No Tricks...Only Treats” Halloween gift baskets are guaranteed winners! Inside they'll find a full 2-pounds of top shelf Halloween treats from all the top brands including Snickers, Twix, Starburst, Milky Way, Tootsie Roll, Skittles, and tons more! 1.5 lbs. of Mixed Candies - We’ve included 1.5 lbs. of top-tier candies, with fruity favorites like Starburst, and Skittles, and nostalgic favorites like chocolate and fruity Tootsie Rolls and Tootsie Pops. .5 lb. of Mixed Chocolates - Each of these Halloween gifts includes brand name candy bars like Milky Way, Snickers, Three Musketeers, and Twix. Decorative Halloween Bucket - This sturdy, decorative Halloween pumpkin bucket holds a full 2 lbs. of candy, and will be around for years to come.